I love trolling youtube for interesting videos of traditional music posted by people from all over the world. Some of the stuff posted there are documents of traditions that have totally bypassed official or commercial distribution, stuff that used to be unavailable to anybody except the intrepid field ethnomusicologist with a tape recorder. I just found a couple of youtube videos of the great Maramures fiddler Ion lui Grigore Covaci, also known locally as “Paganini” who lives in the village of Saliste in the northern Romanian region of Maramures. Ionu is about 75 years old now, and is mainly known as one of the best fiddlers of the devilishly tricky Maramures style of fiddle. Ion also comes from a long dynasty of musicians of Gypsy origin (he would never use the term “Rom” to describe his background) from the town of Viseu, and during his youth he heard local Maramures Jewish music played by his own family as well as by members of the Shloimovitch family band in nearby Rozavlea - not the particularly famed dwarf Jewish theater and band of the related Ovitch family. I've written about them and the Shloimovich band on this blog, and during that trip I had the pleasure of going on a crazed road trip with Ion to Hoteni to visit Ion Pop, the leading personality in traditional Maramures music today and a musician who works with Ionu quite a lot. Ion Pop included a set of Maramures Jewish tunes on a Cd produced by the excellent Ethnophonie label in Romania and available via the equally excellent Passion Music in Britian. I have also visited with Ion quite a lot over the years, and he is quite the character, as you can see in these videos. In this first one, he seems to be on some kind of television cavalcade of Romanian traditional musicians, and is asked to play a set of the Jewish tunes he heard as a youth. In the second video, Ionu starts out by playing the classical peasant doina, the story of a shepherd who loses his sheep, which has become something of a set piece among Maramures fiddlers. He also seems totally nonplussed by having his fiddle go completely out of tune on live TV, something that most musicians would never live down. The Jewish part begins at around two minutes into the clip - there is a part where Ionu imitates the sound of the Yiddish speaking badkhen or Marsalinka directing the wedding in between tunes. 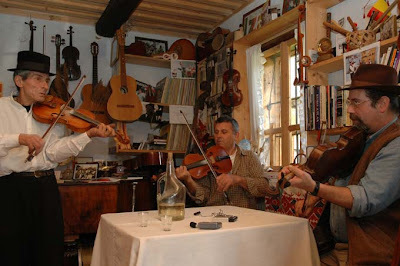 Ion never actually played with the Shloiovich band, but neighboring fiddlers from Ieud and Dragomiresti did. I spent days hanging with them mainly to get a sense not only of the repertoire used in the region, but also the style in which Jewish musicians preferred to perform it. The typical Maramures accompanying instrument since the first world war has been a retuned guitar known as the zongura, and today it is used as background for almost all Maramures music. Most of the older generation of Maramures professional musicians specified that Jewish musicians never used the guitar, preferring all string bands, so what we are hearing is a modern recreation of the repertoire, without any obsessive attempt to present a historical model. Here is another clip made with Ionu outside of his home in Saliste in which you get a sense of what a complete entertainer he is - he loves swinging his fiddle above his head. He's a professional village primas... this is how you make a living. On this final video, Ionu begins the set of Jewish tunes about 1:30 into the clip. These are all tunes we use in my band – we recorded them during the sessions for our last CD Traktorist, but the set proved too long to fit on the CD and so it sits on my shelf waiting for me to release another CD in the future. It is deep into a Budapest July, and given the economic macro-situation in our household, we have been staying at home most of the summer. We are in the middle of a heat wave, broken almost every three days by a cold front which brings on tornado style winds and hail storms. As I mentioned, this is good for very little but... wild mushrooms. Down at the Bosznyak Market this week it the mushroom sellers were pushing chanterelles, called róka gomba "fox mushrooms" in Hungarian. As I said a few posts back, all wild mushrooms sold have to be checked and certified by a resident mushroom expert at each market. Most of my mushroom picking friends learned their expertise by sitting with these folks at the height of mushroom season and watching how they identify the different types of wild mushrooms. Gombavizsgálat means "mushroom examinations." You can trust these folks. They mean business. Nobody gets sick. Chanterelle mushrooms are firm and meaty. These cost about FT 500 for 30 dekas, enough for two of us to really make a meal from them. If you were to order these in a New York restaurant you would be explaining things to your banker next week. We also got some Oyster mushrooms, which are cultivated in Hungary and don't have to go through the examination process. I used to see these in the USA in gourmet supermarkets - in Hungary they are almost as cheap and common as regular mushrooms. I usually eat these in soup. Most Hungarians simply saute the mushrooms and serve them over meat as a sauce, make omlettes out of them, or stew them with paprika and onions for gomba pörkölt. I like the natural flavor of the mushrooms to shine through, and the best mushroom dishes I have ever had were in Italy... the market ladies always ask me "and how do you prepare them?" Pretty simple: saute them in olive oil with crushed garlic and a pinch of salt. Serve with pasta. But I like to have a bit of meat with my pasta... usually we hit a small butcher market in the back of the market that serves a largely Gypsy clientele, mainly because it is cheap and serves less than fancy cuts of meat. Which can mean different things in Hungary - I buy beef cheeks here for stew at a ridiculously low price, since nobody knows what to do with beef cheeks. Those babies are US$20 a pound in New York at wholesale prices for restaurants. But since it is scorching hot these days we do most of our cooking out on our ancient Turkish electric grill on our porch, and duck hearts were on sale. Marinated in lemon juice, olive oil, garlic and black pepper they grilled up very fast. Voila! Grilled duck hearts with chanterelle mushrooms on capellini. Just taking some time out of our heavy summer schedule to wish my sister a happy birthday! 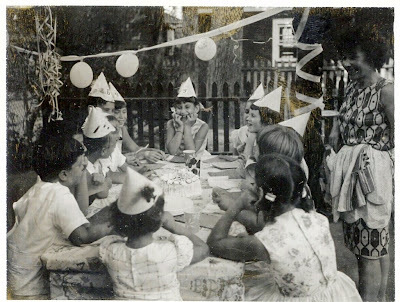 She's (_fill in blanks__) years old, and my, my, she has always loved a party! For those of you who don't know, my sister is a highly regarded medical research doctor in the States. If you or somebody you love has ever taken a medicine and not died or gotten horribly sick from it from it, you can thank her. But before opting for the curing of the human body, she used to work on the human soul. 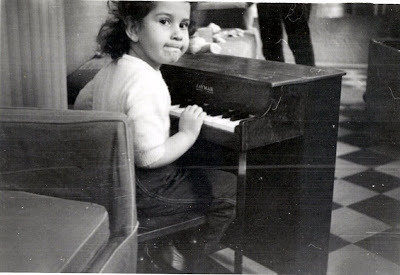 Pam was one of the best classical pianists in New York during her time - she won the New York City competition several years running while at New York's High School of Performing Arts and went on from there to Julliard. In this picture, you can see the seeds of that talent taking root. Always an avid performer, I have dozens of photos of my sister in various ballet costumes, but I am too much of a gentleman to display them here. 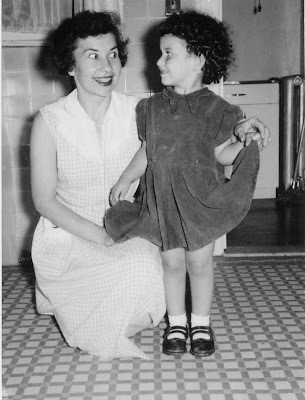 Here's one of my favorites, taken with my Mother sometime in the middle of the twentieth century. Happy birthday sis! The weather this spring and summer in Hungary has been a series of warm, sunny weeks followed by cold stormy weeks, one after the other. The positive take on this is that this makes for the perfect conditions of a great porcini mushroom year. Porcinis (vargánya in Magyar, cèpe in French or boletus edulis in Latin) are usually available each summer but the prices are usually too high to buy them often. A month ago porcinis were available in the markets at FT 3500 (US$17) a kilo. Last week they dropped to FT 1500 ($7) a kilo. We picked up a bit less than a half kilo – a bit extravagant, but worth every forint. Wild mushrooms are often for sale in the open markets. Each market has an official examiner who double checks all mushrooms being sold to make sure no poisonous varieties are mixed in, then the mushrooms are certified and the certificate is displayed by each pile of mushrooms. At this time of year a lot of chanterelles are on sale. Some of my friends are mushroom hunters and during the spring and early summer they often unload shopping bags full of “chicken of the woods” on me – it’s a flat tree fungus with a hefty texture that you can treat almost as meat. Porcini (cepes, vargánya in Magyar) puffballs comprise the group of four mushrooms known for safety there are few poisonous mushrooms that resemble them. Hungarians will often bread and fry the larger porcinis, but I prefer to let the delicate fresh shrooms flavor a pasta sauce: simply olive oil in which garlic has been sautéed and removed, black pepper, and sliced shrooms. Risotto is also a good way to get a lot of mileage out of pricy porcinis, but since we have an obscenely large stiock of dried mushrooms on hand in the pantry, we eat mushroom risotto quite often - for fresh porcini, tossing them in with with fresh tagliatelle is the answer. As for the crazy weather… we had a huge sudden storm last week with hail balls the size of cherries flying horizontally at sidewalk level. I grabbed my camera to catch it and as I was filming one of my basil plants was actually blown off the terrace – it landed in the garden below and survived. I only noticed it when Fumie came home and told me the basil was missing. I was too caught up in filming the storm to see the basil take wing - it takes its leap into oblivion at around 30 seconds in.